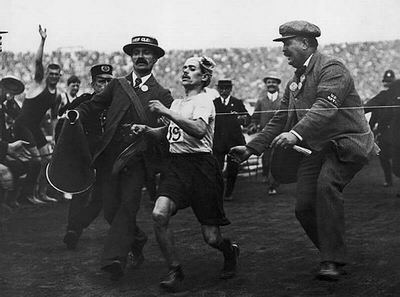 Diminutive Italian marathoner is denied gold medal in 1908 Olympic marathon in London but becomes an international celebrity after his surreal stagger to the finish line. And, Dorando’s story inspires America’s greatest 20th century song-writer to write his saga in song. This entry was posted in ESPN Sports Today and in the Day and tagged baseball, gambling, say it ain't so, shoeless joe.